When Modulus Graphite founder Geoff Gould was still at Modulus, all the Quantum basses were shipped with a certain set of medium-gauge stainless-steel string, with taper-core B and E. Modulus no longer uses this string design, but Geoff has gone back to the original string manufacturer to have them made again. 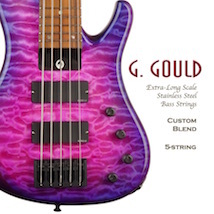 Now featured as standard equipment on the new G. Gould Basses, these strings will fit other 35" scale basses, such as Modulus, MTD, Peavey, Spector, and Dean. This product weighs 0.43 pounds.